600w ballast, bulb, and ez cool 6 combo! 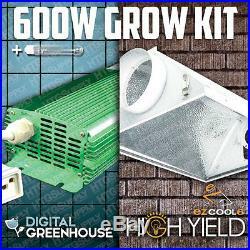 Digital Greenhouse 600w Digital Ballast, 600w HTG Supply High Pressure Sodium Lamp, and High Yield Lighting's EZ Cool 6 Reflector. At FULL POWER, this Ballast will operate at peak efficiency, driving the lamp / bulb to full output, delivering the energy your plants need to grow to their full potential. This Ballast operates 600w High Pressure Sodium (HPS), Metal Halide (MH), and Metal Halide Conversion (MHC) lamps. Built-in fans keep the Ballast very Quiet and Cool. This will help aid the Ballasts lifespan. Buit-in "Smart Chip" adjusts between HPS and MH lamps automatically. 18" L ; 15" W ; 7.5 H. Tempered-glass lens and a 6 flange for forced air ventilation. Adjustable Socket Bracket for ability to change light dispersement. Lamp will not "sag" as is common in. (results in no "Hot Spots"). Aluminum Reflective insert for superior light reflectivity and light dispersal. 600w HPS Bulb emits 95,000 Lumens. Universal Socket Set comes with all of our systems. Check and MO's are also accepted. We operate our own retail website as well as 13 brick-and-mortar stores across the country, and we have a knowledgeable staff with real experience that can help you get what you need to achieve great results. The item "Digital 600 watt HPS GROW LIGHT AIR COOLABLE REFLECTOR" is in sale since Wednesday, August 26, 2009. This item is in the category "Home & Garden\Yard, Garden & Outdoor Living\Gardening Supplies\Hydroponics & Seed Starting\Grow Light Parts & Accessories". The seller is "htgsupply" and is located in Cranberry Township, Pennsylvania.